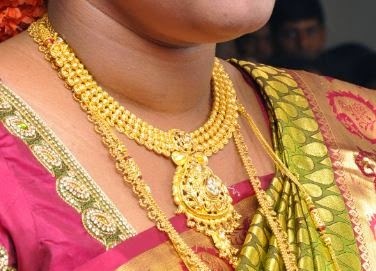 The Government is actively considering a proposal under which all Hallmarking and Assaying centres will assign a unique nine character code to the jewellery for purity and traceability. This information was given by the Minister of State for Consumer Affairs, Food and Public Distribution, Shri Raosaheb Patil Danve in a written reply in Lok Sabha today. The Government has set up an Inter Ministerial Committee for considering the requirement of separate legislation in respect of Direct Selling / Multi Level Marketing. This information was given by the Minister of State for Consumer Affairs, Food and Public Distribution, Shri Raosaheb Patil Danve in a written reply in Lok Sabha today. He said that at present in the absence of any separate regulatory framework business models like Direct Selling/ Multi Level Marketing come under the purview of the Prize Chits & Money Circulation Schemes(Banning) Act, 1978 administered by Department of Financial Services. As part of amendment to the Act, Department of Financial Services had examined the feasibility of incorporating specific guidelines for these business models. It has been suggested by them that instead of incorporating theses models into the PCMCS Act, the need for a separate legislation may be examined by Department of Consumer Affairs in consultation with all stakeholders concerned including global practices in operation. • To examine the nature and growth of Direct selling/MLM companies in the country over last 5 years. • To examine the factors/features that distinguishes the above models of business strategy from Pyramid, Money Circulation Schemes. • To examine whether or not standalone legislation is now required to regulate the above business models. • If so, the possible framework for such legislation based on the existing laws and regulations including that in other countries. • Identification of goods, services and operational issues to be covered under the new legislation. • The committee will be free to record evidence of other stakeholders such as IDSA, Consumer Groups etc. • Any other related issue. In order to create more storage capacity for foodgrains, Private Entrepreneur Guarantee (PEG) Scheme has been implemented in the country and a total capacity of 121 lakh MT has been created. This information was given by the Minister of State for Consumer Affairs, Food and Public Distribution, Shri Raosaheb Patil Danve in a written reply in Lok Sabha today. The Minister said that storage capacity is being created under this Scheme in Public Private Partnership (PPP) mode through private parties, as well as agencies in Public Sector like Central Warehousing Corporation (CWC) / State Warehousing Corporations (SWCs) for guaranteed hiring by FCI. Guarantee period for private parties is 10 years whereas for Public Sector agencies it is 9 years. In case of private parties, state wise tenders are invited by designated nodal agency under a 2 bid system. An individual, partnership firm, company or a trust can apply under the Scheme. The tenderer either should have land in his possession or he may acquire it within 120 days from the date of acceptance of tender. Such tenderers who are holding land under registered lease for a minimum period of 13 years are also eligible. At the technical bid stage, sites are inspected and bids in respect of only those sites which are found suitable are processed further. Tenders are allotted to the lowest bidders. Non railway siding based godowns are to be constructed in one year whereas godowns with railway siding are allowed two years construction period. This period can be extended by one year at the request of the investor. After completion of the godown, final inspection is carried by a joint committee of FCI and the Nodal agency and godowns completed in all respects and as per specifications are taken over on guarantee basis. An integrated action plan to contain prices of essential commodities, online tracking of foodgrains procurement and distribution to make it more efficient and drafting major amendments in Consumer Protection Ac for empowerment of consumers were some of the initiatives taken by the Ministry of Consumer Affairs, Food and Public Distribution during last seven months. These initiatives had direct positive bearing on common man. Food inflation fell down to 0 % at the end of second week of this month. Adequate and timely availability of foodgrains was possible in remotest area inspite of natural calamities like Hud-hud,Floods in J&K, disruption in major rail route due to gauge conversion in North-East. New experiments like shipping of foodgrains to Tripura made for this purpose. Consumer complaints redressal became just a phone call away with the integration of consumer helpline system. Sugarcane arrears which were Rs 14,095 crore (as on May 31, 2014) came down to Rs.3567 crores (as on 15.12.2014) as a result of concerted efforts to facilitate the payment. 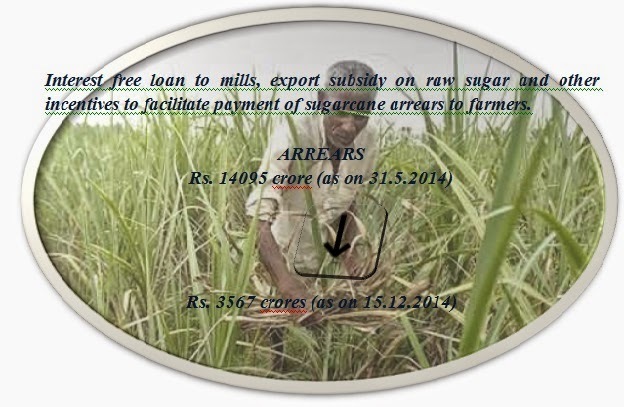 , 6.12 % of the total payable sugarcane prices of Rs.58, 269.63 crores to the farmers for sugar season 2013-14. In view of weak monsoon in some parts of country, an increase was noticed in the prices of some of the essential commodities. 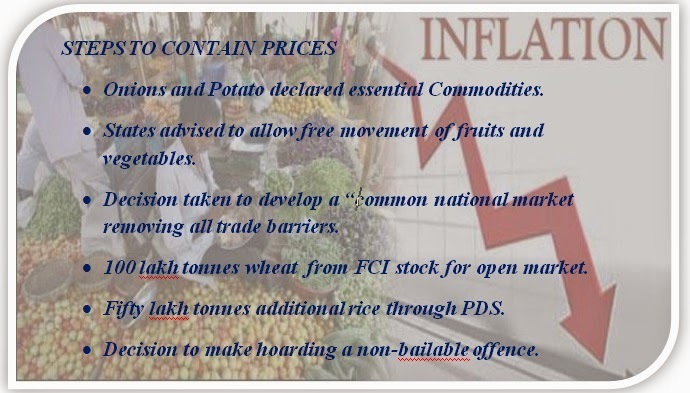 Ministry of Consumer Affairs, Food and Public Distribution acted swiftly and a conference of State Food Ministers was convened on 4th July to plan both long and short term strategies to contain prices. “Onions and Potato’ were declared ‘essential Commodities” so that stock control orders could be issued and anti-hoarding measures could be taken by the States. Futures trading in rice suspended and Stock limit Imposed on paddy and rice till November 2014, till the arrival of new crop to ensure easy availability of essential commodities at reasonable prices. States advised to allow free movement of fruits and vegetables by delisting them from the APMC Act so that farmers could have wider selling choice and consumers could avail at cheaper prices. Moreover to overcome the situation of scarcity of some food and vegetables in one part of the country and excess supply in other , decision taken to develop a “common national market” by removing all barriers on interstate trade. The Government also decided to create a “Market Intervention Fund” for direct intervention in the case of unreasonable increase in prices of food items. Price Monitoring Cell of the Ministry which monitors prices of twenty two essential commodities strengthened further by increasing number of reporting centres from 57 to 64 and improving the reporting mechanism. Not only that the States asked to set up their own Price Monitoring Units to supplement the Central Government efforts. In order to moderate prices of wheat and rice, release of 100 lakh tonnes wheat from FCI stock for open market was approved. Fifty lakh tonnes additional rice was also through Public Distribution System with this objective. The Ministry of Consumer Affairs, Food and Public Distribution also decided to make hoarding a non-bailable offence and to increase the period of detention for black marketing of Essential Commodities by amending the Essential Commodities Act, 1955 and the Prevention of Black Marketing and Maintenance of Supplies of Essential Commodities Act, 1980. 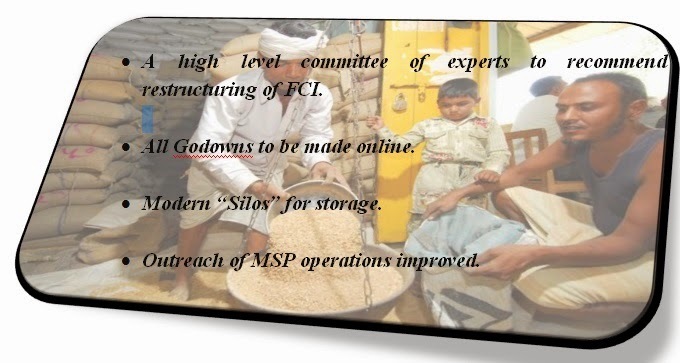 A high level committee of experts under the Chairmanship of Shri Shanta Kumar, Member of Parliament set up on Aug 20, 2014 to recommend restructuring of Food Corporation India for improving foodgrains management in the country, efficient MSP operations, scientific storage and strengthening supply chain. Extensive consultations with stake holders and States are underway. The committee is expected to submit its report next month. Meanwhile computerisation of FCI operations is being taken in a big way. Online Depot System initiative to bring operations of all Godowns online in a time bound manner to check reported leakage. To modernise storage decision taken to build modern “Silos” and eleven sites identified for such Silos. Storage capacity also augmented by completing 120.67 lakh MTs capacity by October, 2014, out of 200 Lakh MT capacity approved under Public Private Partnership . In order to benefit more farmers by improving outreach of MSP operations, the Government decided limit the levy of rice on millers upto 25%. Implementation of National Food Security Act remained priority of the Government. It remained in touch with States to ensure its speedy implementation. Eleven states have implemented the Act while remaining 25 states have also committed for early implementations. In a meeting of State Food Secretaries convened on Dec10, 2014 state- wise reviews were held to see the preparedness. They states were asked to make the PDS totally transparent by adoptiing end to end computerisation. They have been advised to list beneficiaries on web portal, display movement of ration, and all the related information, digitise ration cards and seed them with AADHAR. Meanwhile the Center continued timely allocation of food grains to the states which are yet to implement Food Security Act. During the current year, the Ministry released additional 66.45 lakh tons of foodgrains to these States for distribution at BPL rates and APL rates. These States were also allocated 7.11 lakh tons of foodgrains for festivals, calamity relief. This was in addition to the provisional allotment of 483.30 lakh tons of foodgrains already made to the States under normal TPDS allocation, including the allocation under National Food Security Act. Swift actions ensured adequate supplies of food grains during natural calamities of Hud-Hud cyclone in Andhra Pradesh and devastating floods in J&K. Food Corporation of India (FCI) supplied 16,500 packets of rice, in 10kg also, for distribution in far flung areas of floods affected Jammu Kashmir on the request of State Government. Similarly in North Eastern States, inspite of disruption in rail route due to gauge conversion, from Lumding to Badarpur, adequate availability of foodgrains was ensured and first time rice was shipped from Andhra Pradesh to Tripura through Bangladesh water ways in Oct 2014 for this purpose. Payment of sugarcane arrears to the farmers by the mills was the matter of great concern for the Government. The Government took various measures to facilitate payment of the arrears to the farmers, which included interest free loan, export subsidy on raw sugar, and other incentives to sugar sector. As a result sugarcane arrears came down to Rs.3,567 crore (as on December 15, 2014) from Rs 14,095 crore, 6.12 % of the total sugarcane prices of Rs.58, 269.63 crores payable to the farmers for sugar season 2013-14. Amendments proposed in the Consumer Protection Act and BIS Act for greater empowerment of consumers. Provisions made to ensure speedy, inexpensive and simple dispensation of justice for the consumers. Decision taken to setup National Consumer Protection Authority with all the executive and enforcement powers for redressal of consumer grievances and to take penal class action against defaulting companies. In order to ensure quality product and services for consumers, amendments also proposed in the Bureau of Indian Standards Act, 1986. Provisions of re-calling of products, enhancing the financial penalty and to reduce the long process of litigation proposed. Decision also made to include more products and services for mandatory standards certification. Simplified scheme of self-declaration of conformity also proposed for helping industries to conform to ISI Standards. Under the Swacch Bharat Abhiyan, steps taken to formulate/upgrade standards for potable water, street food and garbage disposal. Consultations were held at National level to take views of all stakeholders on proposed amendments to Consumer Protection Act, in New Delhi on 3rd September, 2014 and on BIS Act amendments on December1, 2014. To tackle the menace of misleading advertisement, the department of Consumer Affairs set up and inter- ministerial Committee. Grahak Suvidha Kendra (Consumer Care Centres) planned accross the country. The centres will serve as single window facility for consumers to get their grievances redressed with facilities of counselling and mediation also .Trained officials manning these centres will not only provide pre-purchase advice but also take up the grievance of the consumers with concern to resolve on priority. Existing Consumer Grievances Redressal mechanism also strengthened by integrating facilities provided by National Consumer Helpline and Consumer Online Resource & Empowerment Centre (CORE). Inter Ministerial Committee set up to see how interests of Consumers can be protected in the era of direct marketing of goods and its first meeting was held on Dec8, 2014. Applications format for grant of grants from Consumer Welfare Fund digitized and improved for greater transparency. Joint campaigns organised with Heath, Financial Services and other departments for greater consumer awareness. Financial assistance released to State Governments for strengthening Consumer Courts and testing laboratories under Legal Metrology. Inter Ministerial Committee set up to see how interest of Consumers can be protected in the era of direct marketing of goods and its first meeting was held on Dec8, 2014.